With a decade of perspective on which to draw, it’s clear that David Blight’s Race and Reunion: The Civil War in American Memory (2001) represented both a culmination of and shift within Civil War memory studies. Blight, primarily an intellectual historian, argues that reconciliation came at the cost racial inclusion as “reconciliationist” memory allied with “white supremacist” memory after 1880, thus deleting the war’s black “emancipationist” memory from the historical record. In short, healing and mercy for whites undercut freedom and equality for blacks. Again, Blight outlines three forms of memory (a term he never satisfactorily defines). Reconciliationist memory was highly romanticized and commodified, deleted race and slavery and the role of black soldiers, based on sectional equivalency (each side is equally guilty and therefore free to heal), and focused almost exclusively on battles and leaders. This “slavery was good while it lasted, good once it was gone; no southerner fought in its defense and no northerner died to end it” attitude, exemplified by veterans such as Oliver Wendell Holmes and his “Soldier’s Faith,” actually began with fraternization and at Appomattox. White Supremacist memory, meanwhile, underscored the sin of racial equality, was openly anti-black, often paired with paramilitary ideas, and was exemplified by memory crafters such as Thomas Nelson Page, William Chandler Harris, and D.W. Griffith. Finally, emancipationist memory, associated with writers including W. E. B. Du Bois, Frederick Douglass, and Albion Tourgee, insisted that emancipation was the primary legacy of the war, dealt openly with the war’s causes, and lamented the abandonment of Reconstruction. This last form of memory has been ascendant since the Civil Rights Movement. According to Blight (in a refinement of Gerald Linderman’s argument about Civil War veterans) soldiers’ feelings “incubated” between 1865 and 1880; the war’s meaning became based largely on a single trans-regional identity: whiteness; race became the fulcrum on which postwar identities broke one way or the other; and the white story became the national story. Although Blight could be clearer about why white healing trumped justice, one assumes that white reconciliationist memory triumphed due to racism, abandonment of Reconstruction, fears of populism, and Gilded Age/industrial capitalist anxieties (urbanization, modernization, industrialization). Reunion served as a commodified and socially and politically useful fantasy. To Blight, this undermining of the war’s social promises of economic, social, and racial justice, along with the historiocultural obliteration of the Union’s biracial military coalition, represents the supreme tragedy of the postwar era and facilitated Jim Crow and the nadir of American race relations. 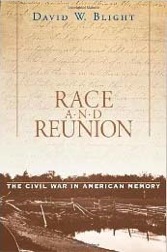 Years after first reading it, I still consider Race and Reunion a truly seminal piece of historical scholarship that transcends categorization as a “Civil War book” (I even assigned it to my upper-level American Civil War class last year). Still, Blight’s magisterial work is not without its limitations—limitations that have become clearer with the passing of time. First of all (and a number of historians have since addressed this), Blight probably underestimates the opposition to reconciliation and the emancipationist legacy among northern whites; he overstates southern unity; he only covers the first fifty years after the war; and he fails to raise the philosophical question of whether or not historians should “judge” peoples’ use of memory. Blight’s work also proves somewhat presentist in that he insists that the undermining of the emancipationist legacy was a betrayal of the war’s true meaning and legacy despite the fact that most northerners never considered the war to be about racial justice or even black liberation and most Union soldiers fought primarily for reunion, not race. The North’s original purpose and primary war aim was reunion and restoration. This critique is central to Gary Gallagher’s newest book on the meaning of the Union Cause and my own work on war and reunion in the Ohio Valley. This entry was posted in Books & Authors, Memory, Reconstruction, Slavery and tagged David Blight, Memory, Race and Reunion, Race-and-Reunion-series, Reconstruction. Bookmark the permalink.